Magnetic CoFe2O4 nanotubes, nanorods and nanowires were synthesized by the template method. The materials are highly crystalline and formed by compactly packed ceramic particles whose equivalent size diameter depends on the nanostructure type. Nanotubes and nanorods present the remarkable characteristic of having very large coercive fields (1000–1100 Oe) in comparison with nanoparticles of the same crystallite size (400 Oe) while keeping similar saturation magnetization (53–55 emu/g). 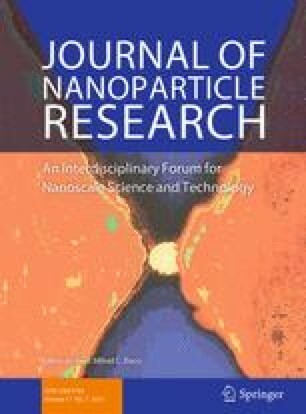 Nanorods were used as filler material in polydimethylsiloxane elastomer composites, which were structured by curing in the presence of uniform magnetic field, H curing. In that way the nanorods agglomerate in the cured elastomer, forming needles-like structures (pseudo-chains) oriented in the direction of H curing. SEM analysis show that pseudo-chains are formed by bunches of nanorods oriented in that direction. At the considered filler concentration (1 % w/w), the structured elastomers conserve the magnetic properties of the fillers, that is, high coercive fields without observing magnetic anisotropy. The elastomer composites present strong elastic anisotropy, with compression constants about ten times larger in the direction parallel to the pseudo-chains than in the perpendicular direction, as determined by compression stress–strain curves. That anisotropic factor is about three-four times higher than that observed when using spherical CoFe2O4 nanoparticles or elongated Ni nanochains. Hence, the use of morphological anisotropic structures (nanorods) results in composites with enhanced elastic anisotropy. It is also remarkable that the large elastic anisotropy was obtained at lower filler concentration compared with the above-mentioned systems (1 % w/w vs. 5–10 % w/w). Guillermo A. Jorge: on leave from Laboratorio de Bajas Temperaturas, UBA. Argentina. PSA, GJ, and RMN are research members of the National Council of Research and Technology (CONICET, Argentina). Financial support was received from the Ministry of Sciences (MINCYT-FONCYT PICT 2011-0377) and University of Buenos Aires (UBACyT 2012-2015 20020110100098). CLPO is supported by FAPESP, CNPq, and INCTFcx, Brazil. The authors thank to the Center of Advanced Microscopy (CMA) at the School of Sciences (UBA) for obtaining the presented images and pictures. AGL thanks to A. Petragalli for obtaining diffraction data and Mg. Mariana Lali (CNEA) for helping with SAED indexs and Ministry of Sciences for the financial support (ANPCyT PICT 2012-1506). In this model, the cluster is assumed to consist of subunits that are aggregated into a ramified structure. For the subunits, we use the form factor for sphere with radius R, given by Eq. (1). There are interesting features for this expression. If the fractal domains, defined by overall size ξ, are smaller than the size of the overall hard-sphere interactions 〈R HS〉, at low angles, we might have a decrease of the scattering intensity, which indicates that the fractal domains interacts as hard spheres among each other. This concept is important to understand the results that are discussed in the text.